The Town of Huntersville was recently selected #76 by Money Magazine as one of the Top 100 Places to Live. It is the largest of the towns surrounding Lake Norman with a population of over 32,000. Huntersville offers plenty of shopping options. One popular shopping area is successful Birkdale Village, an all encompassing live-work-and-play neighborhood. 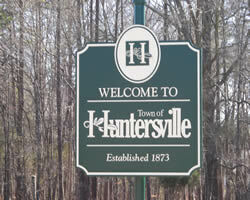 To learn more about the Town of Huntersville, click here. Huntersville is just a short 20-minute commute to downtown Charlotte with easy access to Interstate 77. There is plenty to do here including the annual Amazing Maize Maze, Latta Plantation Nature Preserve, the Carolina Raptor Center, Duke Power's Energy Explorium, and much more. Residents can also choose from a variety of home styles and prices. There are many friendly communities, waterfront properties, and luxurious amenities. Blythe Landing is a 26-acre recreation area with a public floating boat launch, playground, picnic areas, and sand volleyball courts. Events held annually here include Hello! Huntersville," a Christmas and Spring Festival which helps to foster a strong sense of community among the townspeople of Huntersville. Countless business opportunities exist in fast-growing Huntersville. Numerous historic home sites have also been preserved and serve as a living legacy blending both past and present together to create a wonderful fusion. Looking for Huntersville homes for sale? Search our local listings database for access to listings in Huntersville and surrounding areas. Whether you want to buy or sell Huntersville real estate, you can browse through properties or find a wide variety of real estate resources available on this website. If you are looking for a Huntersville REALTOR®, choose Debbie Sloan! As your Huntersville real estate agent, Debbie Sloan can assist you with all of your home buying and selling needs. I can provide you with access to the local listings database and offer our experience and knowledge to make the home buying or selling process easier for you and your family. Contact Debbie Sloan today to get your home search started!